Consider the following data set. 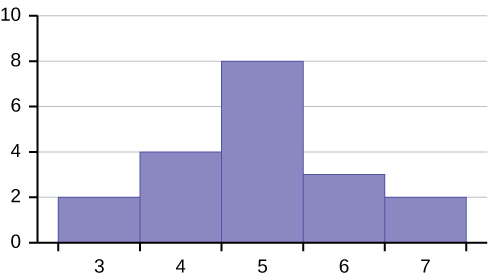 This data set can be represented by following histogram. Each interval has width one, and each value is located in the middle of an interval. 4566677778 is not symmetrical. The right-hand side seems “chopped off” compared to the left side. A distribution of this type is called skewed to the left because it is pulled out to the left. 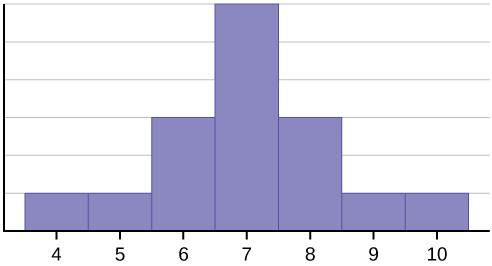 The mean is 6.3, the median is 6.5, and the mode is seven. 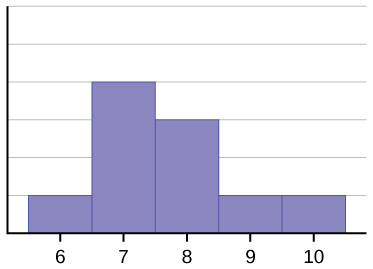 Notice that the mean is less than the median, and they are both less than the mode. The mean and the median both reflect the skewing, but the mean reflects it more so. 67777888910, is also not symmetrical. It is skewed to the right. Statistics are used to compare and sometimes identify authors. The following lists shows a simple random sample that compares the letter counts for three authors. Terry’s distribution has a right (positive) skew. Maris’ distribution is symmetrically shaped. Terry’s mean is 3.7, Davis’ mean is 2.7, Maris’ mean is 4.6. Terry’s median is three, Davis’ median is three. Maris’ median is four. 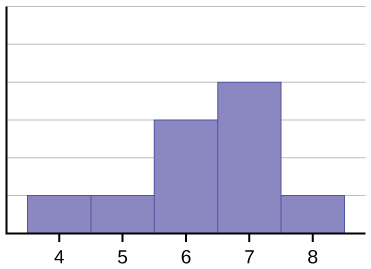 mean = 70.1 , median = 68, mode = 57, 67 bimodal; the mean and median are close but there is a little skewness to the right which is influenced by the data being bimodal. (data are 46, 49, 53, 56, 57, 57, 57, 58, 60, 60, 63, 63, 64, 64, 65, 66, 67, 67, 67, 68, 70, 71, 71, 72, 73, 74, 77, 78, 78, 79, 80, 81, 83, 85, 88, 90, 90 93, 93). These are estimates: mean =16.095, median = 17.495, mode = 22.495 (there may be no mode); The mean < median < mode which indicates skewness to the left. (data are the midponts of the intervals: 2.495, 7.495, 12.495, 17.495, 22.495 and respective frequencies are 2, 3, 4, 7, 9). Looking at the distribution of data can reveal a lot about the relationship between the mean, the median, and the mode. There are three types of distributions. A right (or positive) skewed distribution has a shape like [link]. A left (or negative) skewed distribution has a shape like [link]. A symmetrical distrubtion looks like [link]. The data are symmetrical. The median is 3 and the mean is 2.85. They are close, and the mode lies close to the middle of the data, so the data are symmetrical. 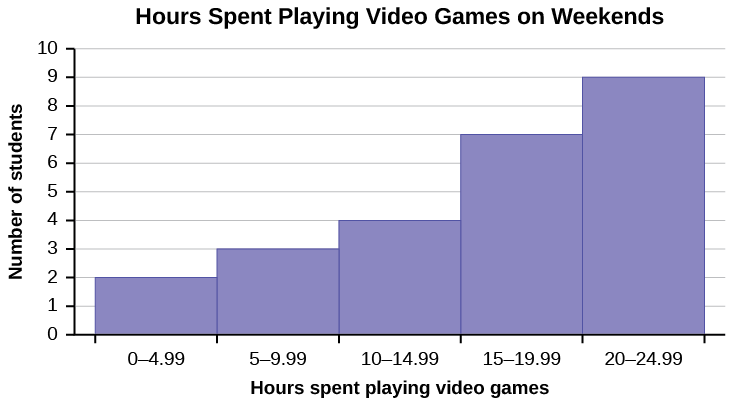 The data are skewed right. The median is 87.5 and the mean is 88.2. Even though they are close, the mode lies to the left of the middle of the data, and there are many more instances of 87 than any other number, so the data are skewed right. When the data are symmetrical, the mean and median are close or the same. 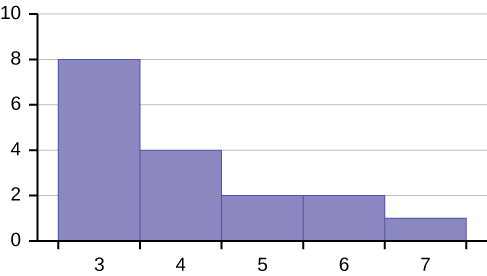 The distribution is skewed right because it looks pulled out to the right. The mean is 4.1 and is slightly greater than the median, which is four. The mode and the median are the same. In this case, they are both five. 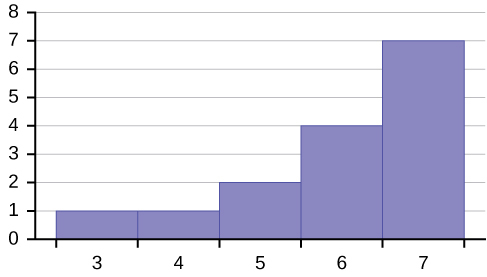 The distribution is skewed left because it looks pulled out to the left. The mean and the median are both six. The mode is 12, the median is 13.5, and the mean is 15.1. The mean is the largest. The mean tends to reflect skewing the most because it is affected the most by outliers. Skewness and the Mean, Median, and Mode by OpenStaxCollege is licensed under a Creative Commons Attribution 4.0 International License, except where otherwise noted.